Some management and staff of Benola Cerebral Palsy Initiative with those from Modupe Cole Home for the disabled and physically and mentally challenged children and adults with the inates of the home, during the donation, recently. Help came the way of some inmates of Modupe Cole Home for the disabled and physically and mentally challenged children and adults as Benola Cerebral Palsy Initiative presented them with wheelchairs, crutches, and walking aid at the tune of the N1.8 million. Making the presentation which was to mark the fifth anniversary of the Benola, AVM Femi Gbadebo, the Founder, said his organisation had taken up the challenge of visiting homes for the abandoned and disabled children on a regular basis. Mr. Gbadebo called on the government to support its advocacy campaign stressed on the need to tackle stigma against persons living with disabilities. He decried the activities of fakers who claim that there is cure for cerebral palsy and lamented that some ignorant parents fall prey to them. Emphasising on the need for more collaboration on awareness about CP, he said; “Various information organs of government like the Ministry of information, Voice of Nigeria, NBC, National Orientation Agency etc and private sector should get involved. According to him, this should come in form of sponsorship of advocacy campaigns, support to families in terms medication, covering the cost of treatment/therapy as well as provision of drugs and assisted devices. However, he explained that Modupe Cole was selected for this particular visit because of its size, number of residents; the dual nature – home and school; and having large number of persons living with CP. Giving details of the donation, Mrs. Gbadebo said this include, 10 wheelchairs, each two representing one year of Benola; eight crutches and eight walking sticks were presented to Modupe Cole Home School. Responding the Benola’s plans for the future; She said; “Our next focus now is to raise money and awareness for our Cerebral palsy family forum in August where we intend to give out 100 wheelchairs and lots of adult and children diapers. 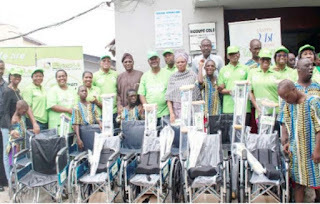 She further observed; “We realised the great need in these areas at our family forum held at the Lagos University Teaching Hospital (LUTH), Idiaraba, last year when over 450 parents and Children with CP showed up and we only gave out 21wheelchairs. We then realised that the need is enormous.